Displayed here in Oak, this handsome Roll Top Bread Box is the larger of the two styles we offer, measuring 16 1/4" wide, 14 3/4" deep, and 12 1/2" tall. This piece is now offered in Cherry, Red Oak, and Brown Maple and available in all our OCS Stains. This solid Cherry, Oak, Maple, Roll Top Bread Box would make a great addition to your kitchen and keeps your bread soft and fresh. So, if you are more concerned about quality and craftsmanship than some our competitors' "mass-produced out of unknown wood" then our bread boxes are for you. 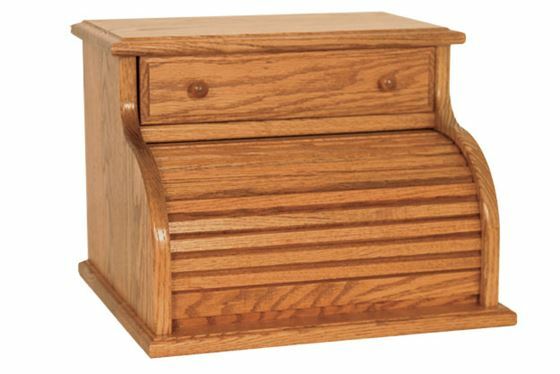 This solid Roll Top Bread Box is hand made by Amish craftsmen in the USA of solid grade A select hardwoods and finished in a beautiful OCS Stain, and clear lacquer Top coat, that brings out the natural wood grain that all of these wood species have been known for, for over the past 200 years. This Roll Top Bread Box measures 16.25" long 14.75" deep and 12.5" high. 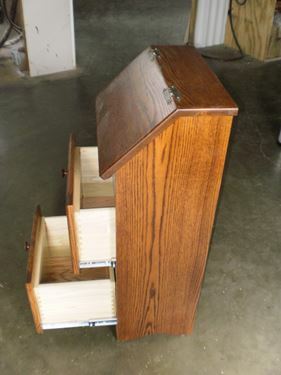 Standing 35" high, 17" wide, and 12" deep, and featuring 2 pull out drawers beneath a built in bread box with a traditional style window with "Bread" printed on it. Your choice of Premium Hardwoods and 30+ Ohio Certified Stain color choices. Also, take advantage of our 10% discount off the purchase price .... Enter the discount code: 123015 into the discount code box located in the shopping cart to activate.